Visual Studio Code>Snippets>Citrix Developer tools for Visual Studio CodeNew to Visual Studio Code? Get it now. Tooling, samples and sdk documentation to help you get with building Citrix enabled applications. 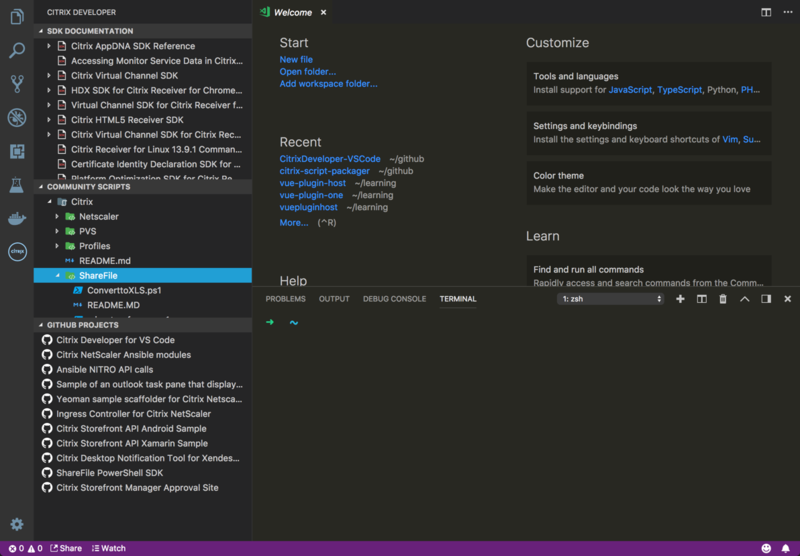 Citrix Developer tools for Visual Studio Code is an extension that helps developers build applications that target the Citrix platform by adding Samples, code snippets and SDK documentation to the IDE. Bug fixed for recursive directory creation on windows. credit to RyanCButler for identifing this bug. 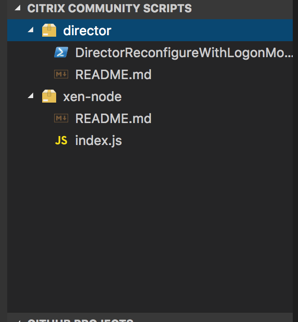 Ability to show community scripts that have a folder structure in them. This allows the script packagers to create a single script will multiple product folder within it. Also updated the citrix-script-packager as well to coinscide with this release. Please refer to that repository for more information. 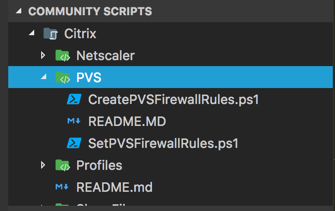 Change the title of the "Citrix Community Scripts" to "Community Scripts" to encourage that this is for all types of community scripts, not just Citrix. If you build a script package, no matter what platform it targets, it will be surfaced here. 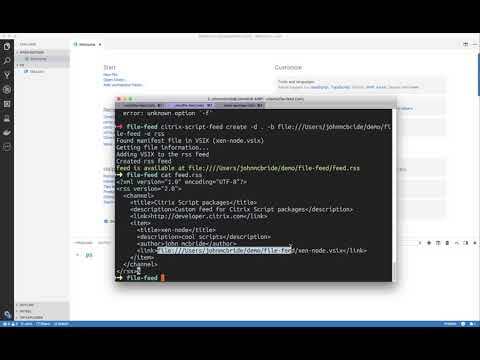 Install Citrix Script package from a configured RSS source. For roadmap based items, we will utilizing the "feature" tag within the project issues along with the kanban board. Install and open Visual Studio Code. Press Ctrl+Shift+X or Cmd+Shift+X to open the Extensions pane. Find and install the Citrix Developer extension. The extension is now activated. You can also download the extension manually from the marketplace here. Sites are open using the defaul browser. Would like to use the in-windows browser of VSCode. Added the ability for the user to install a vsix script package built by the community. Please see the Citrix Script Package project on github for more information on how to build these packages. Moved the citrix based explorer views out into a new activity bar. Added multiple explorer views into the citrix activity bar to include the SDK Documentation, community script and Citrix based Github projects. Refactored the explorer view. Changed name to "Citrix Developer" and added additional nodes for SDK Documentation and Github Projects. Added github features to the listed open source projects, such as clone from url, open issues and open project site. This is shown in the context menu of the github node. Added Citrix Netscaler commands to the command palette for pulling/starting/stopping Netscaler CPX images. Initial release of Citrix Developer Extension for Visual Studio Code.